Mara will share excerpts from an essay on her personal journey of spiritual discover. Her essay is part of a collection by 24 authors recently published by Simon & Schuster, titled “Faith: Essays from Believers, Agnositcs & Atheists.” Mara will be available for Q&A after the service, and copies of the book will be available. DWPC Member and best-selling author Mara Purl will share two intriguing experiences about libraries that have impacted her own work. She’ll then introduce her guest – speaker, teacher and writer Virginia Harris, who was instrumental in the founding and opening of the Mary Baker Eddy Library for the Betterment of Humanity in Boston, the largest collection by and about an American woman. This year, The Monday Club’s theme is “Getting to Know You”. Mara presents an unusual inside perspective on this theme, inviting members to consider not only their “head” perceptions about themselves, but also to consider their own heart journeys. Join Mara as she presents a riveting and dynamic seminar on sub-text and text analysis. She’ll take us beyond the surface of dialogue . . . show why it can be glassy-calm, roiling with emotion, or about to explode . . . all depending upon what’s beneath that surface. Best-selling author and well-known speaker and performer Mara Purl shares her story of growing up in a theatre family, succeeding on stage and screen, becoming an internationally acclaimed writer and best-selling author, then winding up back on stages in the Central Coast. Milford-Haven . . . is it your neighbor town? 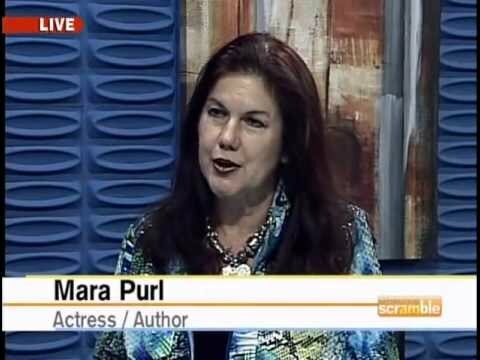 Best-selling author and well-known speaker and performer Mara Purl shares her story of creating Milford-Haven USA, a fictional town set just up the coast from Cayucos. First it was a BBC hit radio show, now it’s a series of best-selling novels and novellas.